"Chased" redirects here. For the short film, see Chased (film). "Chasing" redirects here. For the song by Gemma Hayes, see Chasing (song). For the 2016 film, see Chasing (film). Repoussé or repoussage (French pronunciation: [ʁəpuse]; [ʁəpusaʒ] respectively) is a metalworking technique in which a malleable metal is ornamented or shaped by hammering from the reverse side to create a design in low relief. It is a form of toreutics. While repoussé is used to work on the reverse of the metal to form a raised design on the front, chasing is used to refine the design on the front of the work by sinking the metal. The term chasing is derived from the noun "chase", which refers to a groove, furrow, channel, or indentation. The adjectival form is "chased work". 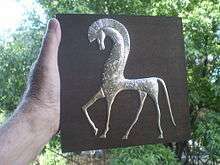 The techniques of repoussé and chasing use the plasticity of metal, forming shapes by degrees. There is no loss of metal in the process as it is stretched locally and the surface remains continuous. The process is relatively slow but a maximum of form is achieved, with one continuous surface of sheet metal of essentially the same thickness. Direct contact of the tools used is usually visible in the result, a condition not always apparent in other techniques, where all evidence of the working method is eliminated. The word repoussé is French and means "pushed up", ultimately from Latin: pulsare, which means "to push". Repoussage is the noun to refer to the technique, with repoussé being an adjective referring to a piece to which the technique has been applied (e.g. "repoussé work", "repoussé piece"). Chasing comes from the French word, chasser meaning to drive out, or to chase around which is what the artists are doing as they "chase" the forms on their metal in order to create their final design. An example from antiquity is the late Eighteenth Dynasty mummy mask of Tutankhamun. The lapis lazuli and other stones were inlaid in chased areas after the height of the form was completed. The majority of the mask was formed using the technique of repoussé from what appears to be a single sheet of gold (the ceremonial beard, Nekhbet vulture, and Uraeus were attached separately). 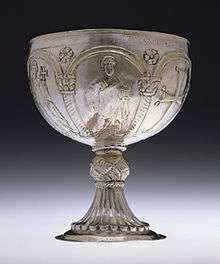 The Warren Cup is a Roman silver cup, and the Mildenhall Treasure, the Hoxne Hoard, the Water Newton Treasure and the Berthouville Treasure are examples of hoards of Roman silver found in England and northern France with many pieces using these techniques. The prehistoric Gundestrup cauldron has relief panels on separate thin sheets on both the inside and outside. The largest known sculpture created with this technique is the Statue of Liberty, properly Liberté éclairant le monde, which translates as “Liberty Enlightening The World,” in Upper New York Bay. The statue was formed by copper repoussé in sections using wooden structures to shape each piece during the hammering process. A second example of monumental copper repoussé sculpture is Portlandia by Raymond Kaskey, which was installed in 1985 in downtown Portland, Oregon. 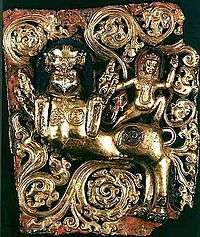 The techniques of repoussé date from Antiquity and have been used widely with gold and silver for fine detailed work and with copper, tin, and bronze for larger sculptures. Classical pieces using this technique include the bronze Greek armour plates from the 3rd century BC. The alternative to pressing gold sheet into a die is to work it over a design in cameo relief. Here the detail would be greater on the back of the final design, so some final chasing from the front was often carried out to sharpen the detail. The use of patterned punches dates back to the first half of the 2nd millennium BC, if not far earlier. The simplest patterned punches were produced by loops or scrolls of wire. By Hellenistic times, combined punches and dies were in use. In 1400 BC, the Egyptian Amarna period, resin and mud for repoussé backing was in use. In 400 BC, the Greeks were using Beeswax for filler in repoussé. It can be laborious to create jewellery or art using repoussé and chasing techniques, although with practice, complex and delicate pieces can be made which would be virtually impossible to complete using any other method. There are different metals you can use for chasing and repousse work, such as drawn steel, silicon bronze, copper, gold, silver and pewter. The process of chasing / repousse takes a lot of time due to the repetition of a number of time-consuming stages: The first step is the preparation of the metal by annealing; cleaning to remove the pitch between annealing and work; setting up; and careful work with punches. This process is typically repeated many times during the creation of a chasing/repousse work. One method of repoussé and chasing is to place a thin sheet of metal on a bowl of chasers pitch. This chasers pitch can be pine rosin–based that can be kept slightly soft with a heat gun or plumbers torch for relief work and hardens when cooled for chasing/planishing work. It can become extremely soft or liquefied when heated too much, becoming somewhat of a burn hazard. It is not recommended, nor necessary to heat the pitch to this degree. The purpose of using pitch is to provide a solid base to work on, whilst allowing the metal to be pushed out and shaped without obstruction. The pitch is best worked on in a pitch bowl or "pitch board." The pitch bowl is a cast iron bowl which sits on a bag stuffed with sand or on a rubber ring specifically made for this purpose. This allows for greater stability, rotation and angling. The pitch is heated using a hairdryer, or an industrial blowdryer. If the pitch is too hard, the metal will be thinned. If it is too soft, you have very little control over the form. A good medium grade chasers pitch works well because it softens enough to allow for satisfactory relief and cools to a firmness that is sufficient for chasing, planishing and detail work. Steel tools are used to work the metal. A "liner" is a steel tool/punch with a very thin, slightly rounded end, that is used to create the initial lines on the metal. The liner is hit on the end with a chasing hammer, pushing a thin line of metal into the pitch. The side facing up will consequently be the front of the piece. Once all the lines have been chased, the metal is then turned over on the pitch, and repoussé technique is then applied, using other various steel punches/tools to push the metal so that it is raised on the front of the finished piece. Once the repousse is done - the design raised, the piece is inverted, and the voids are filled with warm pitch to help maintain its shape. The pitch should be allowed to set in the voids and cool before the piece is turned over and placed back on the pitch. Once the piece of metal is turned over and then chased, in that the details are refined and brought out. The design is worked many times, with numerous tools, before the final result is achieved. Every time the metal is removed from the pitch bowl, it needs to be cleaned and re-annealed. Turpentine is used to remove the pitch, and a blow torch can also be used to burn it off. When working with the pitch, make sure you are working with gloves, safety glasses and good ventilation and as always, when working with any type of open flame, make sure there is an appropriate fire extinguisher close by. There are hundreds of tools which can be used. They are generally made by the jeweller/crafts person. They are typically made from bars of tool steel, which is forged and tempered at the tip. These hardened steel punches may be purchased by a supplier, but the specialized punches are made by the jeweler or special ordered to suit a particular design. 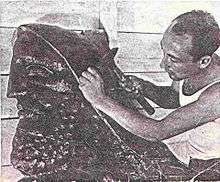 A saw can be used to cut designs into the tip for making patterns, or the tool can be hammered onto a patterned surface, which will indent the tip. The end of the tool which is to be hammered should be bevelled to allow for expansion of the metal from repeated hammering. Some of the main styles of tool include: Liners, planishers, matting, and doming. Liners have thin tips, which are slightly rounded. If they are too thin they will cut the metal. They are used in the initial marking out of the design, and in the finishing stages to refine any thin outlines. Planishers have smooth, flat tips which are used for pushing out large, flat areas of metal. Matting tools have patterns cut into them, and provide detail to areas of the design. Matting tools can also be made by filing a thin line around a steel bar, hardening it, then snapping it. This will result in a fine grain pattern. Doming tools push out rounded areas of metal, and can either be round or oval, quite pointed or almost flat. An oxyacetylene torch, coal forge or propane forge is required for heating the steel sufficiently for forging. The more tools available, the easier it is to create a detailed, accurate piece. The pitch is heated until molten. Plaster of Paris is added a small amount at a time. Resin and tallow are then mixed in. Pitch is backing and filler material, preferably rosin-based, but also petroleum-based, used by metalsmiths to hold the metal in place while working it. There is a flexible pitch used by chasers referred to as Swedish pitch. There are other pitch choices, with two very popular choices being Red (or sometimes referred to as brown) German Pitch and a versatile medium (grade/hardness) dark green chasers pitch. There is also a black pitch. The different pitches are used preferentially and according to the type of chasing and repousse work being done. This pitch material can be re-used indefinitely if used and stored properly. Embossing (manufacturing) - rolling sheet metal through dies to produce a raised or sunk relief design. ↑ "Chalice with Apostles Venerating the Cross". The Walters Art Museum. ↑ Power, Susan (2004). Early Art of the Southeastern Indians-Feathered Serpents and Winged Beings. University of Georgia Press. ISBN 0-8203-2501-5. ↑ Kelly, John E.; Kelly, Lucretia S.; Brown, James (2009). Summary of 2008 Field Excavations to Locate the Copper Workshop in the Mound 34 Area (PDF) (Technical report). Central Mississippi Valley Archaeological Research Institute. ↑ Bowie, Hamish (1977). Jewelry Making. Chicago: Henry Regnery Company. p. 36. ISBN 0-8092-8084-1. "Chasing". New International Encyclopedia. 1905. "Repoussé". Encyclopædia Britannica (11th ed.). 1911.